Agnes Toews-Andrews combines a love of healthy cooking with a comprehensive knowledge of nutrition. 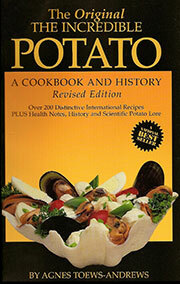 This updated national bestseller (over 20,000 copies sold), has several new sections: health information, international organic and heritage seed potato suppliers, a revised potato variety list for home growers, several new, healthy, low-cost potato recipes, adding to over 200 existing international recipes all based on the nutritious, versatile potato. There is no food on earth as complete as the potato. From delicious breakfast, lunch and dinner dishes; imaginative appetizers, snacks, salads, side dishes, soups, breads, desserts and sweets; budget conscious or gourmet, the potato reigns with an epicurean fillip in this book. Throughout the book, potato caricatures indicate humourous, educational, historical, culinary and nutritional information. The Incredible Potato has a wealth of potato history, nutritional information, culinary information, educational and humorous notes and potato head caricatures! Agnes is passionate about potatoes and her book has been thoroughly researched! Your potato cookbook and history is delightful. I am looking forward to using many of the recipes. Potatoes are in my genes. You sure have allot of interesting ideas. Agnes is best known in Canada as 'The Potato Lady' under her former name Agnes Toews Andrews. Her delightful book The Original Incredible Potato- a Cookbook and History evokes memories of long forgotten potato dishes of our pioneers, not to fail to mention the potatoes nutrition.